Oyster fisherman Tracy Collins shucks an oyster on Caminada Bay in Louisiana. It is a nearly cloudless early June morning on Caminada Bay, Louisiana, aboard a boat surrounded by marshlands and pelicans. Dolphins appear alongside the boat as 72-year-old Wilbert Collins guides the way through the reefs. Scanning the horizon, there is no apparent oil sheen. All the eye can see is what appears to be clean water and a string of orange booms surrounding the bay that people here hope will keep the oil out. Collins is a third generation oyster fisherman from Lafourche parish. When he started his business over 50 years ago, there were 16 other oyster companies working on this bayou. Today, he is the only one left. 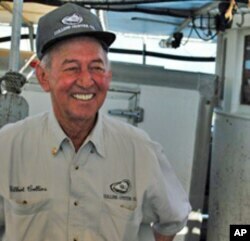 Wilbert Collins, 72, is a third generation oyster fisherman. "Bayou Lafourche was big for oyster boats," he recalls. "When the steam seasons started after Christmas we had four, five, six boats passing this bayou every day loaded down with oysters to go to the steam factory. Today not one. Not one of them." There are a number of reasons why the state's oyster industry was declining long before the Deep Horizon well exploded in April. Supply canals dug by the oil companies carved away land that was home to many oyster beds. Some areas were over fished and in other places, years of river management diverted large amounts of fresh water into the Gulf, altering the salinity of the water oysters need to survive. The boat putters towards a group of empty laundry detergent containers bobbing in the distance. These homemade buoys mark the location where Collins and his sons lease their oyster beds. It's one of 70 leases they have throughout this region. "We travel far and these boats don't go more than seven-eight miles an hour, so it takes us a long time to get where we're going," says Collins. These oysters can't be sold to restaurants or the public due to oil spill safety concerns. When the boat reaches the buoys, Collin's son, Nick, lowers a huge metal claw with a net attached into the water and dredges up a load of oysters. His brother, Tracy shucks one, pointing out the still beating heart. The oyster tastes delicious, plump and salty. No crude has drifted onto this reef yet, so it's safe to eat. But these oysters can't be sold to restaurants or the public. Louisiana officials have closed this area to commercial fishing until the full extent of the damage is known. 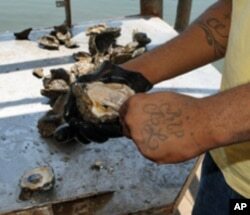 More than half of the oyster beds along the Louisiana coast have been closed. At the moment, though, Nick Collins is more concerned about the fresh water that's already here than with the threat of oil getting into the oyster beds. "There's just too much fresh water. You know like that that river water. It's chocolatey like chocolate milk. It just smothers them." In order for an oyster to survive, it has to live in just the right mix of fresh and salt water. After the oil started leaking into the Gulf, Louisiana Gov. Bobby Jindal increased the flow of fresh water into the Gulf, despite evidence showing the outflow would not keep the oil from washing ashore. Nick Collins worries this could kill all the oysters in a matter of weeks. "You know, it's just hard to fathom what's really happening," he says. "All I know for real is that there's a lot of oil leaking in the gulf and today started hurricane season so I don't know. I don't know." Despite the uncertainty facing Louisiana's oyster fishermen, the New Orleans Oyster Festival kicked off this month in the French Quarter. A stage was erected in a parking lot beside the Mississippi River. Dozens of local restaurants set up booths showcasing their signature oyster dishes. Charlie De Roca of Antoine's restaurant attended for another reason as well. "Really started just as an oyster festival but, now with the oil spill, it's kind of had a whole new meaning for us. So were all out here to support the oyster fisherman and the industry." The Oyster fest is a labor of love for Sal Cinseri, owner of P and J Oyster Company. He originally scheduled the fest for 2005 but had to cancel because of Hurricane Katrina. Even with all the setbacks this year, Cinseri remains upbeat. "We just want people to realize that we're alive and kicking," says Cinseri. "We're having a great time and we want people to support our city and our state and, most importantly, is to get our coastline replenished so this kind of stuff doesn't even happen." A few days after Oysterfest ends, the first signs of oil start appearing in Caminada Bay. No one knows for sure how much damage the oil and dispersants will do to the bay, and the Collins family's oyster beds. It could be years, though, before anyone eats another Caminada Bay oyster.